09-Nov-2012 -- The story starts at 43°S 147°E and continues from 36°S 148°E. On my bicycle trip's section between Melbourne and Sydney, I visited this confluence point, which is on one hand easy to reach but on the other hand it means riding on gravel roads for 35 km. On the eve of the confluence visit, I reached Adaminaby where I had the last opportunity for grocery shopping for a long while. I had camped in a very remote place 15 km west of the confluence point. On the way to the confluence (Jones Plain Road), I saw a meeting with 7 kangaroos in the middle of the road (sorry no picture). 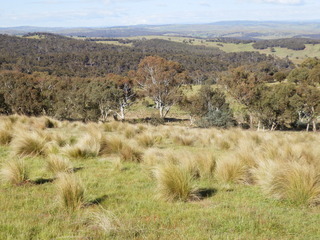 The confluence point is 100 m from Shannons Flat Road that runs north-south from Namadgi National Park and Cooma Town. North of the confluence, the road is a steep, winding forest track on the section in the park. At the confluence, the road surface is asphalt and it can be reached conveniently. The confluence is on an inclined, open meadow with tussocks. There is a far view to the west from the confluence point. Walking over the meadow takes one minute. After visiting the confluence, my plan was to reach Australia's capital city Canberra in the evening. But it almost failed, because I had a mysterious series of flat tires on this gravel section. In all, I had to repair my back tyre 7 times! First, I thought that I had a sharp object sticking in my tire and controlled it elaborately. But there was absolutely nothing. Later, actually after I had experienced those 7 flats, I found out that I had punch flats. The bumpy road and all the weight on the back tire made the rim of the wheel punch the road and thereby squeeze the tube. The solution was to pump it up harder - which was only possible after I had replaced my pump. Vegetation: grass, some trees in 100 m distance. The story continues at confluence 32°S 152°E.